The list of included processes is shown here. 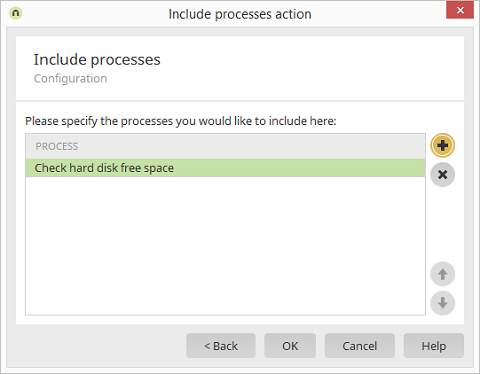 Opens a dialog where processes, which should be included, can be selected. Removes the currently selected process from the list. Adjust the order of the processes. The Include processes action must be associated with an event handler whose configuration	corresponds to the configurations of the event handlers in the processes involved. In the included processes, the setting Handle external events should not be set, as the included processes would then be triggered twice, and would therefore also run twice.